In my past life, scarcity was an influence tool that I used to generate an impact. Scarcity is an influence principle popularised by the psychologist Robert Cialdini in his bestselling book Influence, The Psychology of Persuasion. Scarcity is essentially the psychological phenomenon relating to the fear of loss. In his book, Cialdini argues that “people seem to be more motivated by the thought of losing something than the thought of gaining something of equal value”. This factor is compounded when the item or opportunity in question is rare or becoming rare. At Applied Influence Group we refer to Cialdini’s influence factors and a number of additional factors as external influence pressures, pressures that our societies provide that directly influence our behaviour, often at a subconscious level. 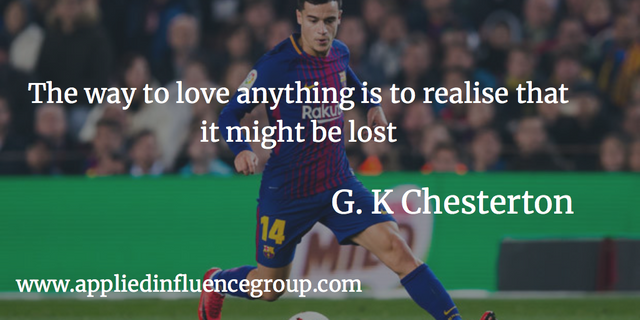 Credible scarcity is one such external pressure that has a distinct impact on our behaviour and this month it is particularly prevalent in one area, football's January transfer window. One crucial element to be mindful of when attempting to influence anybody or any group, is credibility. In my past life, credibility was an essential element in being able to execute a successful influence campaign and it’s the same when attempting to use any external influence factor. For scarcity to have the intended impact on behaviour, the threat of the item or opportunity being lost is crucial in establishing credibility. Once the possible loss has been identified as credible, then the behaviour change that goes with it is often stark. In my opinion, a great example of this was the recent transfer of Liverpool’s Coutinho to F.C. Barcelona. I am a Liverpool fan and I have written a few times now about the impact of influence in sport but this transfer, although inevitable, seemed strange to me. The strangeness was the timing of it. The dust is now beginning to settle and the statisticians have had their say on the impact the transfer will have on both clubs. But the impact for the player was what I was interested in and if reports are to be believed, the player injected a serious amount of his own money to make this deal go through. A deal between two of the world's top 50 richest clubs. Why? As the transfer window heads towards its close, there will no doubt be more evidence of credible scarcity having a distinct impact on behaviour and decision making. I hope it works in your teams' favour.